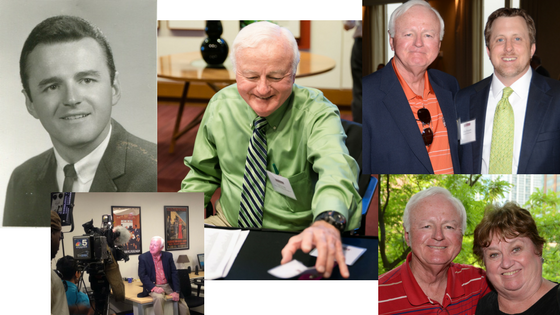 It is with great sadness that we share the news of a beloved Pullman Scholar Alumnus’s passing, Thomas Meagher. Thomas, affectionately known as Tom in the Pullman Foundation office and to other Pullman Scholars, passed away Wednesday, April 19, 2017, in his home. Tom is the epitome of a Pullman Scholar. Tom received his Pullman Foundation Scholarship in 1962 and attended the University of Illinois at Urbana-Champaign with an engineering mechanics major. He went on to work at Caterpillar, Inc. for 41 years before retiring. After retiring he volunteered his time by helping the Foundation. He volunteered for the Pullman Scholar Selection Committee and the annual Pullman Scholar Symposium; he met with recent grads to help them with their job hunt; he volunteered to go on camera to share his Pullman Story, and he met with Foundation staff to share ideas on how to grow the scholarship and Foundation. His contributions to our mission and our scholars are invaluable and we will greatly miss seeing his smile and receiving his guidance and support. If you would like to share a memory or send best regards to the Meagher family we would be happy to forward them via email on your behalf. Please click here to send your email.